For general travel information, please visit www.discoverhongkong.com, a Hong Kong Tourism Board web site. It includes information on attractions, events, dining, vacation packages, maps, videos, webcam and itineraries to experience Hong Kong’s unique living culture. Please refer to Hong Kong Immigration Department web site for detailed information on visa and passport. Most countries do not need visas to visit Hong Kong. Citizens of certain countries such as Cuba or Vietnam should plan well in advance. In October the weather should be a comfortable 20 Celsius outside. Regardless of the outside weather you are advised to bring something long sleeved or a pashmina as air-con can be cold. The voltage in Hong Kong is 200/220 volts, 50 cycles. Most hotels provide adaptors but you are encouraged to bring your own. The summit venue provides no adaptors. Water can be drank after being boiled. Bottled water is also widely available in hotels and supermarkets. All water direct from government mains in Hong Kong satisfies the United Nations World Health Organization standards. There is no tax on consumption of food and entertainment. Hong Kong is one of the world’s most popular shopping paradises. Here are some suggestions that are on Hong Kong Island and close to the conference venue. Causeway Bay is popular with fashionably attired youngsters morning, noon and night, Causeway Bay’s many renowned malls, shops and street stalls are overflowing with fantastic clothes, shoes and accessories. Stanley Market is 30 by Taxi from the conference venue and is a great place for shopping, dining and have a quiet drink by the bay. Dance the night away in Lan Kwai Fong. 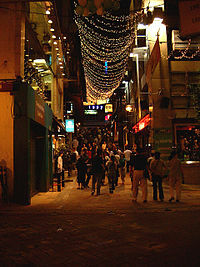 Hong Kong’s nightlife capital, LKF’s many clubs, bars and restaurants are alive with local and foreign partygoers until the small hours of the morning.